This will be a one Round Flex tournament with the option of playing a second round for an additional $20 only with your best score counting for the prize payout. Air Capital Disc Golf Club is responsible for all refunds/cancelations. - 4:00pm Stone Creek Swap Meet. 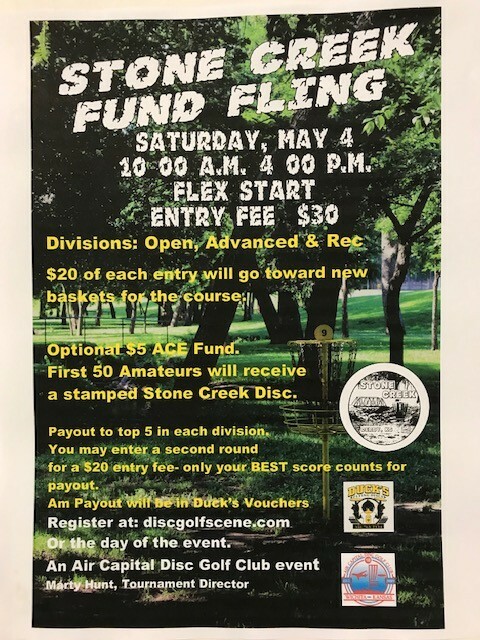 Used Disc Golf equipment for sale from area disc Golfers.20% from each sale goes to the Stone Creek Improvement Fund. 10:00am Disc Golf Play. A second round to improve your score for only $20. Only one payout per player- best score counts.